When you like or share a comment, picture or link with others, you may want to be aware of the dangers that are affiliated with what seems like a harmless way to make the world better. Well, at least your friends and acquaintances world better. There are a lot of scams out there. I’m pretty sure most have seen the pictures that says “Like and Share This picture and you will become a millionaire”. Or, you may have seen the ones where they are saying that if you like this picture and share it Jesus will bless you. Lately there has been a picture of a dog that has a piece of ham across it’s face. Yet people are sharing it like crazy because a hoax is going around that this poor dog has been burned. We need to click and share his picture to show him some love. 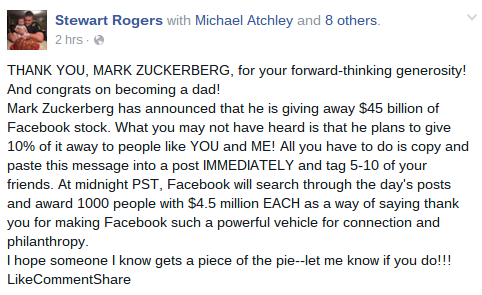 Over the past few weeks or so, there has been a popular hoax that involved Mark Zuckingberg the owner of Facebook. If we like and share the picture then he will give us like 14 million dollars. The only one that was getting rich off of this scam is the ones who came up with the scam to begin with. Those who create these pictures and pages are making huge commissions because we click and like a picture. My daughter Jessica was talking about one of the hoaxes going around and I wish it was true for her sake since she is pregnant. She was saying how Cold Stone Creamery would give a free ice-cream to pregnant women if they are showing and looks pregnant. These types of pictures are designed to tug at your heart strings. The way it works is that someone will create a page and they start posting inspirational quotes and images. Once you like and share the post or image, it will start showing up in the news feeds. The more we share and like a page, the more it will show up. It eventually takes on a life of its own. The ones that gets me is the ones that wants us to share out of support for someone else. What I am meaning is that it will say something like, “My sister thinks she is ugly, like this photo to show her how pretty she is.” In most cases, there isn’t a real sister. It is a ploy to get you to click on said image so someone can make money off your year likes and shares. Have you ever noticed how when you go to Amazon or search for a product, it will show up all of the sudden as an advertising on the news feeds or the side. When you click and share things, you may have allowed malware to be loaded into your computer. Viruses and other things have basically infected your computer without you even noticing it. OK, So I gave you some warnings about scams, but what can we do about it? 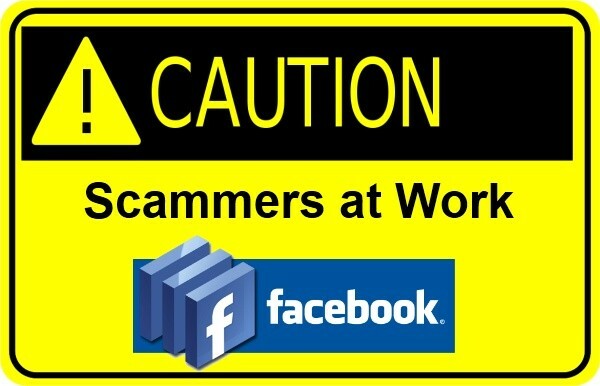 There are ways to secure your Facebook page and to not send your friends to the wolves. If you use the “Friends” setting on your Facebook instead of “friends of friends“, then that is a step in the right direction. This setting will allow only your friends to view your posts, not everyone else. 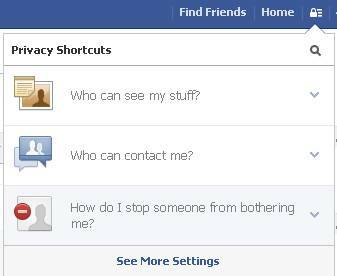 You will find these settings under your privacy settings at the top of the page. Before you like or share a picture or post be sure who you are sharing it with. You can set up by clicking on custom on your post. If you see a globe it means that what you are posting or sharing is a public post. Everyone can see it. So make sure you want everyone to see what you are posting before you click post. If you see two heads, that means you are posting it for “friends of friends”. If there is just one head, that means that only those on your friends list can see what you are posting. If you have liked something and I have done this many times, you can unlike it. Go to your profile and choose the “more” button. You will see where you are given the option to “unlike”. This is an awesome feature since there are times I have liked something and regretted it later. I have some friends on Facebook that is over zealous when it comes to liking things. On my page, I made sure that I don’t get all the news feeds and I will let them know that whatever they are sharing is a scam or a hoax. You may also want to make sure you don’t have your phone linked to your Facebook page. People that you may not know can now call you if you list your phone. On my cell phone I have hundreds and hundreds of peoples names and numbers that are on my facebook page. This is possible because numbers are synced through google chrome. I had to go in and edit my info to make sure to not make it so people can call me through Facebook. Click Here for information on editing that. There are places you can go when it comes to making sure if something is real or not. The place I go to is “Snopes.com”. You can search for whatever it is that you are looking for. If you check it out to begin with, you may save yourself a lot of trouble in the long run. Now, there are times when I share posts and those are from places that I know are legit. Usually the ones I share are places that are secure and known. If you see something I have shared, I have checked it out. If you are careful social networks like “Facebook” can do great things like connecting with friends and family. I would just recommend that you go into your privacy settings and make sure your information is secure. The world doesn’t need to know everything about you. If someone see’s my posts and pictures, that means you are on my trusted list. Not everyone can see everything I post on my wall. Lastly, I just want to say that if you aren’t sure if someone sent you something, just ask them. Great advice, Sandie. I have gotten very picky about what I share, and “like. ” Also, on most of the photo posters, I click to tell Face Book to not allow them on my news feed page. I never play games, and have told FB to not allow anyone to “invite” me to any game, but it still happens, so I ignore them. After your blog, I’m going to be even pickier.